A little more than a month after revealing the sketches and christening it, Mahindra & Mahindra has just launched the TUV300 compact SUV at a starting price of Rs 6.90 lakh (ex showroom, Pune) for the base T4 variant. The TUV300 has three variants on offer — T4, T6 and the top-spec T8. As seen in the sketches, the TUV300 has bold styling cues on its exterior. Built on Mahindra’s new third-generation body-on-frame chassis, it features a prominent bonnet, squarish wheel arches, a high ground clearance and a tail gate-mounted spare wheel. Mahindra had mentioned earlier that the styling cues for the car have been borrowed from a battle tank, to lend the TUV300 a tough stance. In the cabin, the passengers will be greeted by a dual-tone dashboard complete with features such as a 2-din infotainment system and steering- mounted controls. The talking point is fact that the TUV300 comes with a seven-seat configuration, thanks to a jump seat on either side behind the second row. The arrangement is similar to the one seen in the Quanto. 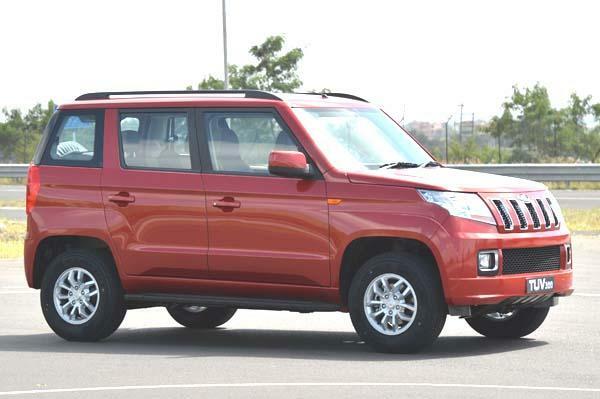 Mahindra has paid close attention to optimise fuel efficiency in the TUV300. The SUV gets Mahindra’s Micro-Hybrid technology, seen in the XUV 500 and the Scorpio, that automatically switches off the engine when idle and in neutral gear to help save fuel and reduce emissions. The TUV300 also comes with an Eco mode as well as an AC Eco mode, which balances engine power for driving and AC usage to help deliver high fuel economy. Powering the TUV300 is Mahindra’s updated mHawk engine called the mHawk80. The engine, which will only be offered in a diesel guise, displaces 1,493 cc – just under 1,500cc – and qualifies the TUV300 as a small car. Using a twin scroll turbo charger, the mHawk80 engine churns out 84bhp and 23.45kgm of torque. Power will be sent to the rear wheels via a five speed manual or an AMT gearbox. Mahindra is offering the TUV300 with safety features such as dual airbags, ABS on some variants of the TUV300. Mahindra’s earlier offering in the sub-four meter SUV segment, the Quanto, failed to sell as per the carmaker’s expectations. The homegrown automaker aims to increase its market share in the utility vehicle segment with this launch. The TUV300 will directly rival the established Ford Ecosport.